#FallingPlates is on YouTube and it is going global. Almost daily, international emails come to me requesting additional subtitles / closed captions in their own language so they can share it with their friends. I've been crowd sourcing the translation work by involving volunteers to do the translating. The script is short - only 189 words. 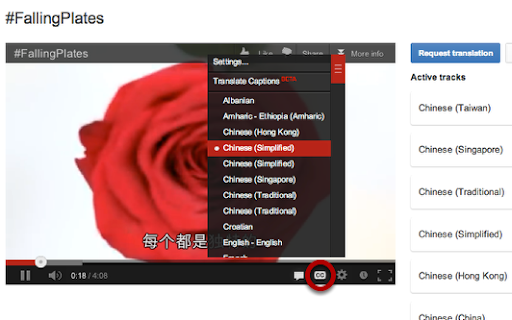 If you have a language you'd like included in the closed captions, it is very quick and simple. 2) I'll email you back a link to a Google Doc where you can quickly enter the new translation. 3) I'll post it to YouTube as a new transcript. And I created every one of them. I gave you your personality. You cut yourself off from me. It just kills you faster. So I became one of you. You have so many sins. And they have a cost. So I took on your sin. And traded in my life for yours. I rose from the dead. I'm not here to condemn you. I came to bring you back to life. And give you eternal life. to have a relationship with you.